Roger Ebert: “The Friends of Eddie Coyle” works so well because Eddie is played by Robert Mitchum, and Mitchum has perhaps never been better. He has always been one of our best screen actors: sardonic, masculine, quick-witted, but slow to reveal himself. He has never been in an absolutely great film; he doesn’t have masterpieces behind him like Brando or Cary Grant. More than half his films have been conventional action melodramas, and it is a rare summer without at least one movie in which Mitchum wears a sombrero and lights bombs with his cigar. But give him a character and the room to develop it, and what he does is wonderful. Eddie Coyle is made for him: a weary middle-aged man, but tough and proud; a man who has been hurt too often in life not to respect pain; a man who will take chances to protect his own territory. Film Comment: The beauty of his performance as Coyle is how completely he blends in with the rest of the cast—Peter Boyle, Richard Jordan, and many others more obscure—with not a trace of a star’s aura to foreground him. Yet of course he is in the foreground anyway; he could hardly help it. It was never easy for Robert Mitchum to get lost in a crowd on screen. In an early walk-on in The Human Comedy (43), as one of three GIs on leave, he effortlessly dominates the scene by standing there doing nothing at all, without even a line of dialogue. He was an actor who—apart from his version of Brechtian stylization in The Night of the Hunter and his sporadic Australian accent in The Sundowners—rarely had to do more than open his eyes or stand or sit down to convey remarkably nuanced feeling. The part he plays here is almost no part at all: a man used up, already defeated—he’s had his knuckles smashed for an earlier mistake—who lives from one small job to the next, the seasoned hard-boiled loser who knows he’s doomed but would never be so weak as to acknowledge it. At moments he seems to be talking to himself, performing for his own benefit as if to check that he’s still bringing it off. Deep weariness and disappointment hover in every gesture and line reading, especially when he manages to get off a funny remark. By the time he goes down for the last time—sad and drunk at a Bruins game, working up some halfhearted enthusiasm for “Number Four, Bobby Orr”—it already feels like an afterthought: he’s been a walking dead man since he walked into the frame for the first time. But from beginning to end we are persuaded—and this was Mitchum’s mysterious genius—that his Eddie Coyle is a man we’ve known, or even been. NYTimes: "The Friends of Eddie Coyle" is so beautifully acted and so well set (in and around Boston's pool halls, parking lots, side-streets, house trailers and barrooms) that it reminds me a good deal of John Huston's "Fat City." It also has that film's ear for the way people talk—for sentences that begin one way and end another, or are stuffed with excess pronouns. "What you don't know, it don't bother you," a friend might say to Eddie. Unlike "Fat City," however, "The Friends of Eddie Coyle" is interested in plot and narrative suspense. The film splits its attention between Eddie, as he slowly evolves into a stool pigeon in an effort to stay free, and the more or less conventional caper movie sequences that show us how to rob a bank. Mr. Yates ("Bullitt") is so good at this sort of thing that it's probably difficult to resist putting it in. There's nothing wrong with it, but it does diminish the impact of Eddie's story, which could have been quite special. Slant: But Mitchum doesn’t remotely overshadow the film’s first-rate ensemble of character actors. 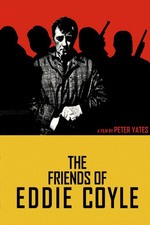 While the screenplay somewhat streamlines the puzzle-like structure of George V. Higgins’s assured crime novel, director Peter Yates shifts from one uneasy conversation scene to another between players in Eddie’s milieu: the detective (Richard Jordan) who extracts tips from a menacing Irish-wiseguy bartender (Peter Boyle) for $20 a week, a gang of bank robbers (led by Alex Rocco) whose fate will be tied to Coyle’s, amateur buyers, and hopped-up suppliers. The titular “friends” is a representative sour joke; survival makes friendship unthinkable, or as Steven Keats, memorable as the properly paranoid, arms-dealing Jackie Brown, tells a client as he holds him at gunpoint, “This life is hard, man, but it’s harder if you’re stupid.” (Given the eyesore that is Jackie’s souped-up chartreuse car, being tasteless apparently isn’t judged an impediment.) The movie’s witty, no-nonsense word-jazz is mostly lifted from Higgins’s book: Mitchum’s opening negotiation with Keats in a coffee shop (“Ever hear bones breaking? Like a man snapping a shingle”) and Boyle’s musings to Jordan on the ubiquity of pigeons add color without strain, hitting the ear like Mamet crook-talk stripped of the studied minimalism. flickeringmyth.com: As Coyle we have Robert Mitchum in perhaps his best, most understated performance (think the opposite of his terrifying Max Cady in the original and best version of Cape Fear) and a key role in 70s crime cinema. His use of stillness and barely a gesture shows us a man who is tormented on the inside, resigned to his fate if he doesn’t break his own code, whilst battling self-preservation until the end. The end of the movie is so downbeat and dour, but we knew this was coming just as Coyle does; but seeing Mitchum in those final scenes asleep in the car, not moving, is an actor without ego playing character who is completely expendable. The ending is an as-matter-of-fact a conclusion you’re ever likely to see. When we learn the truth of who said what to whom, we’re at once betrayed then our emotions are quickly corrected; Coyle would have done the same thing. It’s only business, nothing personal and that makes The Friends of Eddie Coyle genre-defining perfection. There is a reason this film is so downbeat, and why it is nonetheless considered a classic. The film is an adaptation of the well-regarded novel of the same name, authored by George V. Higgins, and Higgens had long experience with actual crime. He was a deputy assistant attorney general and Assistant United States Attorney, as well as having worked as a journalist and having been Assistant U.S. Attorney for Massachusetts, explicitly tasked with addressing organized crime. He borrowed the story of Eddie Coyle from a number of sources, including Billy O’Brien, a former bank robber who was gunned down in Boston. And then there was O’Brien’s alleged killer, Whitey Bulger — he was a bar owner, a killer, and an informant, and Higgins admitted he was the basis for Peter Boyle’s character. Bulger is probably more famous now as the inspiration for Frank Costello, the character played by Jack Nicholson in “The Departed.” But there is something far more menacing about Boyle’s portrayal. His gangster is very workaday — they all are in this film, as though crime were a working class profession, done with no great enthusiasm, just a grind like any other job. Ambition costs you in this world — when the bank robbers go down, Boyle shrugs it off, saying they knew there were risks in going after money like that. “Killing Them Softly” is likewise based on a book that’s a sequel to a book, both by George V. Higgins. The first was, of course, 1970’s “The Friends of Eddie Coyle,” which became the Mitchum film, and the second was 1974’s “Cogan’s Trade,” which became “Killing Them Softly.” There’s some visible crossover, too, if you look. The murderous ex-con Dillon, played by Peter Boyle in “Eddie Coyle,” makes a brief appearance, played here by Sam Shephard. Both films take place in Boston, although a little less so with “Killing” — it was lensed in New Orleans and makes no effort to hide the fact, although all the dialogue, and some of the accents, reference Beantown. Killing Them Softly was a letdown for me, but I'm willing to give it a second shot. I hadn't even realized that it wasn't set in New Orleans. I assumed they had arbitrarily changed the location from Boston. Peter Boyle gets less credit than he's do, I think. Every time I see him pop up he seems to turn in a really nice performance. Eddie Coyle is a neat temporal counterpoint to other big crime films of the same era--its contemporaries were things like Mean Streets, The Godfather, Dirty Harry, etc., and Eddie Coyle avoided all of the flash and style and turned in a grim, gritty story that probably contained more truth than the rest of those films combined. I've been meaning to watch this for Boston locations and 70's look. Old blog post talks about locations. read the comments. I see it's set more on the south shore, less familiar with that area.